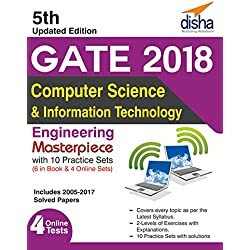 GKP’s GATE Computer Science & Information Technology 2018 has become one of the most popular books for GATE prep since its inception in 1994. The current edition is thoroughly updated and revised as per the syllabus prescribed by GATE conducting body IIT, Roorkee in 2017. In order to help the students thoroughly equip them for the exam, this book provides 24×7 accesses to premium content through an android app and a web portal.